▪ Montana Brown knows the halls of Atlanta’s Aflac Cancer Center inside out. The 24-year-old underwent chemotherapy there as an infant, for a rare type of cancer affecting the connective tissue, and at age 15, when the cancer returned. Now, Brown is back again—but this time as a pediatric oncology nurse. She was inspired to study nursing thanks to the compassion the staff showed her during her own health battle. “I love the fact that I can I say [to patients], ‘I know exactly what you’ve been through,’” says Montana. ▪ Franz Jacob may look tough, with his grizzly beard and tattoos—but for many parents, he’s a hero. 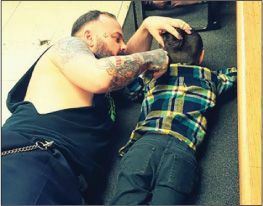 The Quebec barber recently gained viral status after one mom posted a photo online of Jacob lying on the floor with her autistic son while calmly cutting the 6 year old’s ha the day to give them his full attention. ▪ A Minnesota man not only rescued a kidnapped teenager, he then gave her his $7,000 reward. Earl Melchert, 65, was driving by his lakeside property when he saw a female figure in the distance. He immediately recognized her as Jasmine Block, 15, whose face hsuffice and gave them the money instead. “It’s the best thing I’ve ever done,” he says.